Emma joined the Better Body Group team recently after graduating from St Mary’s University with a degree in Sports Rehabilitation. Throughout her time at university she gained intensive knowledge in the diagnosis, treatment and rehabilitation of injuries. If you are looking to lose fat, get fit, recover from an injury or just need maintenance, Emma is here to help you achieve your goals! Emma has previously worked with Esher Rugby Club and Surbiton Hockey Club providing soft tissue treatment and rehabilitation to help them achieve their full potential and back to full health. Emma is enthusiastic about using a variety of training methods to help provide individual and personalised sessions to suit your needs. 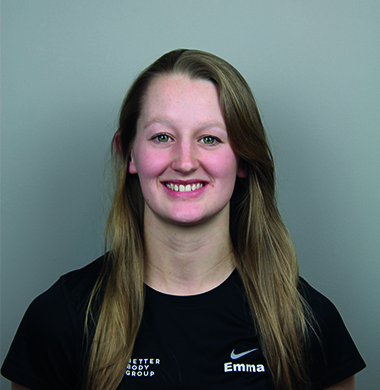 From an early age, sport has played a big part of Emma’s life with most of her time being focused on training for athletics where she has competed nationally and internationally in both high jump and heptathlon. She also enjoys coaching athletes of all ages in her spare time. From being involved in sport for a long time, Emma has experienced the challenges it can throw at you, the most common sustaining numerous ankle injuries. This has fuelled her ambition and drive to help others overcome and better themselves as she knows how much of a struggle it is to come back bigger and better. Emma has a very bubbly and friendly personality and who is always wearing a welcoming smile. From wanting to lose fat, getting fit, recovering from an injury or just needing maintenance, Emma is here to help you achieve your goals!